Bolt expresses and inflames the reactionary propaganda and race hatred of a section of Australian society — a section who are exploited by politicians such as Pauline Hanson, particularly during times of economic stress, writes John Passant. ANDREW BOLT has written yet another outrageous column. He goes on to assert that "we", that is, Australians, are being colonised. Who, according to Bolt, is doing this colonising? He lists some examples – comprised of the "usual suspects" – who are forming these "colonies" in various suburbs of Sydney or Melbourne: the Chinese, Indians, Vietnamese, Muslims, Cambodians and others with non-English speaking origins. In response we say to Andrew Bolt and white supremacists everywhere: we are not interested in assimilating to White Australia. We are not interested in being subjects of your racist attacks. We – as migrants, as people who have lived in this country for a long time, as people who have faced racism and antisemitism of so many different guises over such a long period of time – are here to tell you that we will win and you will lose. Your vision for how society should operate will never succeed. We will continue to work with other others to ensure that a strong, cohesive, anti-racist, justice-based society is the future for "us" all. 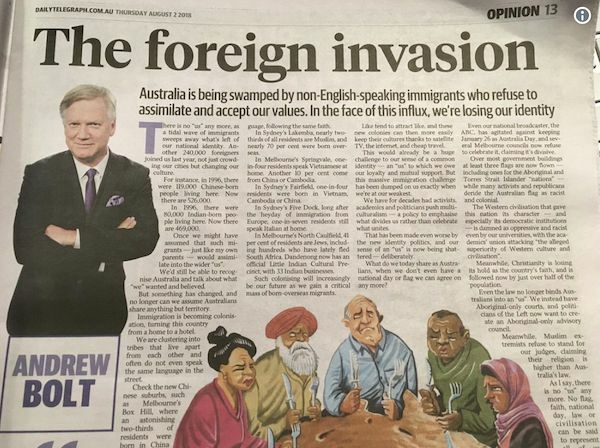 Clearly, Andrew Bolt’s othering is all-embracing — from white Jews and those speaking a foreign language to Muslims of any colour and brown and black people. Evidently, what this amalgam of people threaten is "us" and our "values". For Bolt, "us" appears to be a 1900s vision of a White Australia, with a few English-speaking Europeans and their offspring (like Bolt, himself, who was born in Australia to newly-arrived Dutch immigrants) thrown in. This "us and them" approach, by the way, also excludes refugees and Indigenous Australians. Presumably, socialists like me are outside the inner circle too. The Australian values Bolt has in mind appear to be so-called "Judeo-Christian" ones. So, carrying on the threat theme, he warns us that only just over half the population are now Christian. So what? Change in a changing world is the only constant. This is especially the case with our supposedly "racial make-up", given that Australian capitalism is built on the immigration of skilled workers from across the globe. Imported capital and imported labour are the bedrocks of Australian capitalism. Christian values (often accompanied by Tony Abbott-like assertions about the "superiority" of Western civilisation) are really just the capitalist and imperialist values of the ruling class. They include hard work (for us, not them), individualism, exclusion, war and hate. "Love your neighbour as yourself" seems to be missing from this right-wing political Christianity. What has prompted Bolt to flick the switch to total exclusion? History is one clue. The rulers of the colonial settler state that is Australia, have always felt threatened by the possibility someone might do to them what they did to the original inhabitants. Depending on which period in our history, the object of hate has included Aboriginal and Torres Strait Islanders, the Irish, the Chinese, the Japanese, Asians more generally and various religious targets from Catholics, to Jews, to Muslims. Our ruling class justify the genocide on the basis of racial superiority, or superior civilisation, or religious absolutism, or a combination of all three. They hide the genocide to stop questioning minds undermining their system and its rationales. Distraction is a second clue as to why Bolt has upped the ante. Uniting around nationalism, or race, or religion, or culture (or whatever the focus of fake unity is) supposedly unifies workers and others with those who exploit and oppress them and distracts us from their attacks on us. It seems to have worked with the White Australia Policy, ANZAC Day, Australia Day, Christian values and so on. As we reject the economic and political messages and actions of Bolt and his overlords, we can expect this turn to racism, xenophobia and cultural superiority to become more and more pronounced. "Leadership" is the third clue. In the run-up to the five by-elections recently, PM Turnbull and Minister for Home Affairs Dutton unleashed racism and xenophobia. So-called African gangs, refugees and immigrants all became targets or perhaps, more accurately, a reminder of the "threats" we face. All Bolt has done is take the race hate and scare-mongering from Turnbull and Dutton to its next level. Bolt is not alone. His comments about being swamped echo Pauline Hanson in 1996 about being swamped by Asians, and her 2016 comments about being swamped by Muslims. The extreme Right, have brought people like Lauren Southern and Stefan Molyneux to Australia to proselytise and organise against Muslims, Indigenous Australians and refugees. Some of that extreme Right are Nazis. Until now, the more intelligent ones have kept their anti-Semitism under wraps. Bolt’s article might tempt them to spread anti-Jewish hate more openly. Hate speech leads to hate actions. Just recently, a South Sudanese teenager was stabbed in what is believed to be a racially motivated attack. How can we stop this ongoing race to more and more hate? Politically we can oppose this. We could support Press Council complaints against Bolt, petition for his removal and for his editor to be sacked, and call for action to be taken under the Racial Discrimination Act. However, in 2011 Bolt was successfully prosecuted for breaches of section 18C of the Act, which broadly makes it unlawful act in a way which is likely to offend, insult, humiliate or intimidate a person or group because of the race, colour or ethnic origin of the other person or group. Despite being convicted of this unlawfulness, it does not seem to have quelled Bolt’s enthusiasm for further reactionary propaganda and race hatred. This is because, as racism escalates among the extreme Right, Bolt is positioning himself as the reactionary of outrage. Bolt both expresses and inflames the irrationality of a section of Australian society, a section – as Pauline Hanson’s One Nation shows – whose numbers grow during periods of economic stress and when the fighting Left is weak. One Nation votes are one of the reasons why the Turnbulls and Duttons of our political world flirt with, dance with and ultimately embrace othering. Our task has to be to build a mass fighting force of all the disparate groups that want to resist that racism and xenophobia wherever and whenever possible.